Max (Siberian Husky) finally stole the stick from Ava (German Shepherd) after constantly trying for quite a few minutes. White German Shepherds are usually bred to have an overall softer, more mellow, more sensitive personality than traditionally colored (black and tan) German Shepherds. Because of this sweeter temperament, White German Shepherds are almost never used in protection dog sports such as schutzhund. A White German Shepherd can be a good watchdog, but his "watching" is usually limited to alerting you that someone is coming. 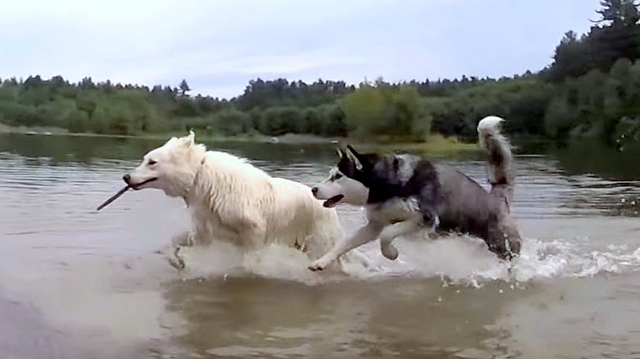 White German Shepherds are not typically aggressive. In fact, if a White Geman Shepherd is going to have any temperament fault, it's more likely to be timidity or skittishness. White Shepherds need a great deal of early socialization to build a confident attitude toward strangers and strange situations. White German Shepherds do need the same physical and mental exercise as other German Shepherds. This smart breed should not be relegated to a home that simply wants a casual pet to walk around the block. White German Shepherds can be quite vocal, tending to whine, mumble, and grumble in attempts to communicate with you. His high degree of intelligence and sense of loyalty have allowed him to become one of the most versatile working dogs (as well as pets) known to man. Responses to "Siberian Husky Steal a Stick From a White German Shepherd "